Mostly made of oceanic crust, the Burma microplate consists of the Andaman and Nicobar island chains, northern Sumatra, and the Andaman Ocean Basin. Surrounded by the Indian, Sunda, Australian and Eurasian plates, the Burma microplate is in a highly tectonically active region of the world. On the western flank lies the Sunda trench, where the Indian plate is subducting under the overriding Burma microplate. To the east lies the Sunda plate, and to the south lies the Australian plate. Oblique convergence on either side of the Burma plate gave it its strange shape, earning its classification as a sliver plate. It was created recently by oblique convergence of plates (Gahalaut and Gahalaut, 2007). Its history began in the Eocene, when India collided with Asia. This kick-started clockwise rotation and caused the plate to tear apart in the late Oligocene, when it broke off from the Eurasian plate (Curray, 2005). Back-arc spreading later created the Andaman Sea. From the Eocene to early Miocene, tectonic activity around the Burma plate greatly increased due to plate collision and rotation. Extension and rifting during the Miocene caused faulting, sedimentation and the opening of the Andaman Sea. Regionally, terrestrial sediment influx from the rapidly rising Burman and Himalayan mountain ranges significantly exceeded the carbonate accumulation rate, and this influx stifled carbonate reef formation along the shelf areas. The former shelf areas were either subducted or became fluvial-deltaic environments (USGS). The modern microplate wasn't formed until ~3-4 million years ago, at which time the faulting migrated from the more southern Mentawai Fault to the Sumatra Fault System. Off the west coast of northern Sumatra on Sunday December 26, 2004, a magnitude 9.1 megathrust earthquake devastated southern Asia. It was the most powerful earthquake the world had seen since 1964 (USGS). 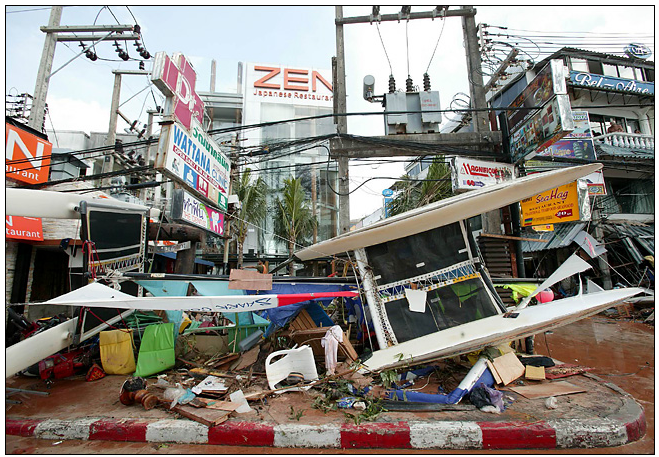 Caused by the release of stresses between the Indian and Burma plates, the earthquake generated a tsunami which displaced close to 1.7 million people, killing 283,000 (Lay et al. 2005). Within 2 hours the wave reached Sri Lanka, which was hit hardest (The New York Times). In Kalutara, Sri Lanka, a satellite image showed that the flooding had reached 500m inland (see slideshow); some of the Indian Ocean's smaller islands had water rush entirely over them. For more information concerning the event, see the Natural Hazards page. Curray, J.R. (1982) "Structure, Tectonics and Geological History of the Northeastern Indian Ocean". The Ocean Basins and Margins. Volume 6: The Indian Ocean. Plenum Press, New York. Curray, J.R. (2005) Tectonics and History of the Andaman Sea Region. Journal of Asian Earth Sciences vol. 25(1), 187-232. Gahalaut, V.K. and Gahalaut, K. (2007) Burma Plate Motion. Journal of Geophysical Research Vol. 112, B10402, doi:10.1029/2007JB004928. Hurukawa et al. (2012) Detailed geometry of the subducting Indian Plate beneath the Burma Plate and subcrustal seismicity in the Burma Plate derived from joint hypocenter relocation. Earth Planets Space. vol 64, 335-343. Lay et al. 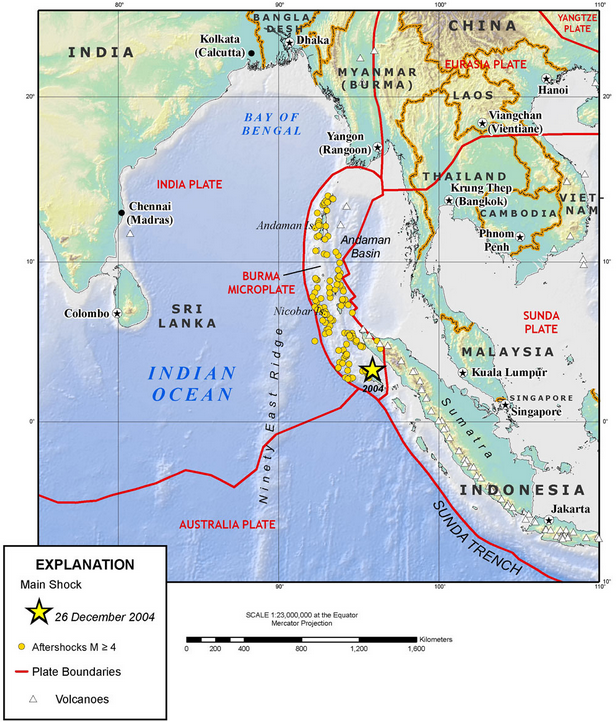 (2005) The Great Sumatra-Andaman Earthquake of 26 December 2004. Science. Vol 308(5725), 1127-1133. Liu, Z. and Bird, P. (2008) Kinematic modelling of neotectonics in the Persia-Tibet-Burma orogen, Geophys. J. Int, vol. 172(2), 779-797. National Institute of Advanced Industrial Science & Technology. http://www.aist.go.jp/ Retrieved January 14. 2014. 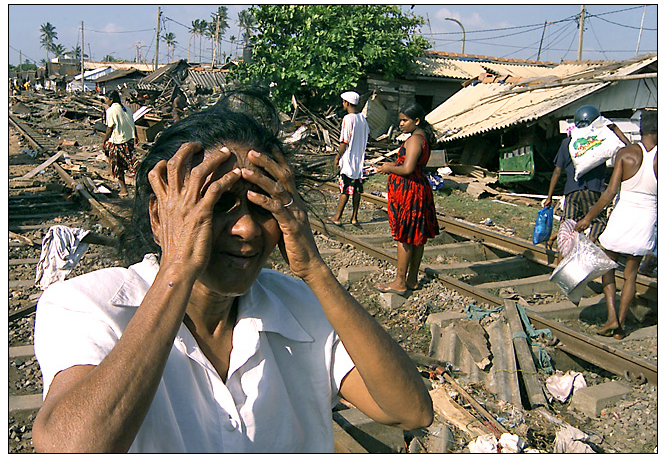 The New York Times, "Thousands Die as Quake-Spawned Waves Crash Onto Coastlines Across Southern Asia," Published December 27, 2004. Retrieved January 14, 2014. USGS Tectonic Summary http://neic.usgs.gov/neis/eq_depot/2004/eq_041226/neic_slav_ts.html. Retrieved January 14, 2014. Wang et al. (2013) Earthquakes and slip rate of the Southern Sagaing fault: insights from an offset ancient fort-wall, Lower Myanmar (Burma) Geophysical Journal International, vol 185, 49–64.